This soft flannel 100 percent cotton lounge robe for men from Alexander Del Rossa is plush, comfortable, durable, and classy. Made from a premium 100% cotton fabric, this men's smoking jacket is breathable and easy on the skin. Designed with you in mind, this classic dressing gown is perfect for lounging around the house - even when guests are present. Rich in features, we trust that this brushed flannel house coat for men will not disappoint. Great for use in nursing homes, hospitals, college dorm or other public settings. Looking for the perfect gift this father's day or Christmas? Look no further! He works hard and deserves a break - give the gift of relaxation father's day with this product from Alexander Del Rossa. Whether for your elderly father, husband, son, or any other dad, we are confident that they will love this product and use it for years to come. Small: Will fit Chests 34-36 inches, Length 52"
Medium: Will fit Chests 38-40 inches, Length 53"
Large: Will fit Chests 42-44 inches, Length 54"
XL: Will fit Chests 46-48 inches, Length 55"
2X: Will fit Chests 50-52 inches, Length 56"
3X: Will fit Chests 54-56", Waists 48-50"
PRE-SHRUNK 100% COTTON FABRIC - Enjoy the comfort of this lightweight robe made from our premium 100% cotton flannel fabric. All of our cotton is pre-shrunk so that you never have to worry about your garment shrinking in the wash. Cotton is a highly sustainable and re-newable resource, meaning you can enjoy peace of mind while you lounge in this soft robe for men. TWO FRONT POCKETS - Each one of our classic lightweight flannel cotton robes for men feature two patch pockets in the front of the garment that are perfect to HOLD YOUR PHONE, snacks, remote, or other necessities. EASY TO WASH - Even though this is a 100% cotton flannel robe, it is not difficult to wash. This robe is machine washable and can be dried in the dryer on low. 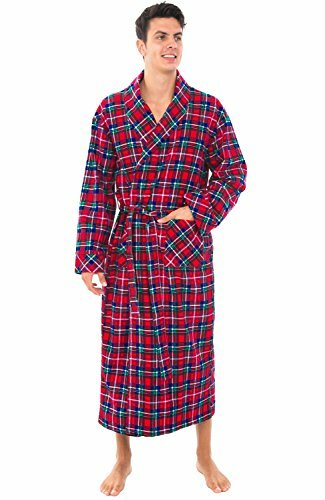 You can even use this robe as a smoking jacket and know that you'll be able to wash any residual smell right out, 100 percent of the time. GREAT AS A GIFT - A robe is one of those warm familiar products that you didn't know you needed until you finally got one - which is why it makes the perfect birthday or Christmas gift for your dad, husband, son, or friend.